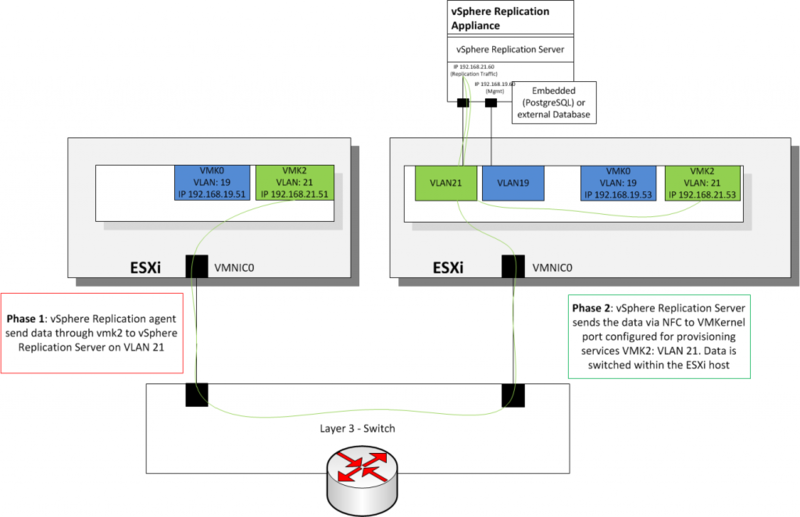 v(e)Xpertise – Yet another virtualization blog. This will be the last post here on vXpertise. For the last years Mathias and myself created many (sometimes) interesting posts here on vXpertise. I still can’t believe we had around 50.000 impressions within the last year, but always great that someone out there (except the bots) is reading stuff we produced. After some bad hacks this year where we lost some of our articles and some personal development within our career we decided not to publish anymore on vXpertise. 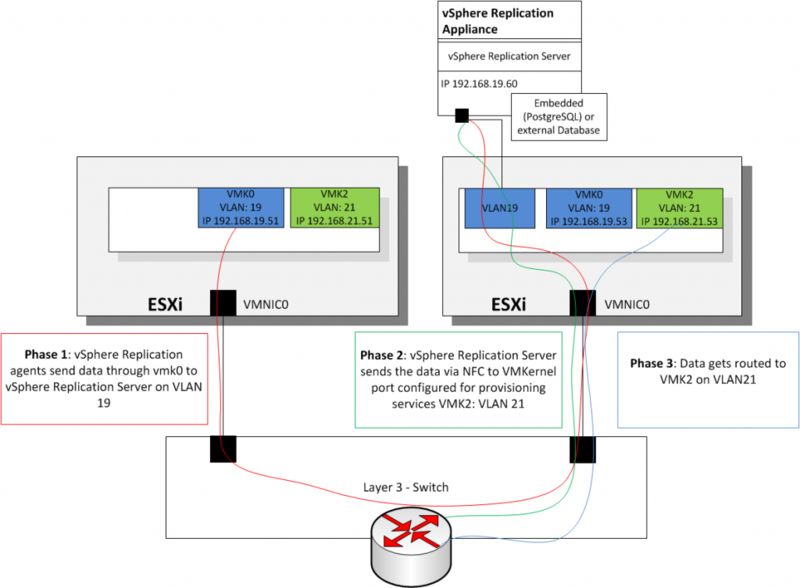 After a few weeks and several reasons (professional and non-professional) I finally restarted writing about my current vSphere replication version 6.0 series. This part 2 focus on some network design options and how they might impact SLAs defined for the Recovery Point Objective (RPO). 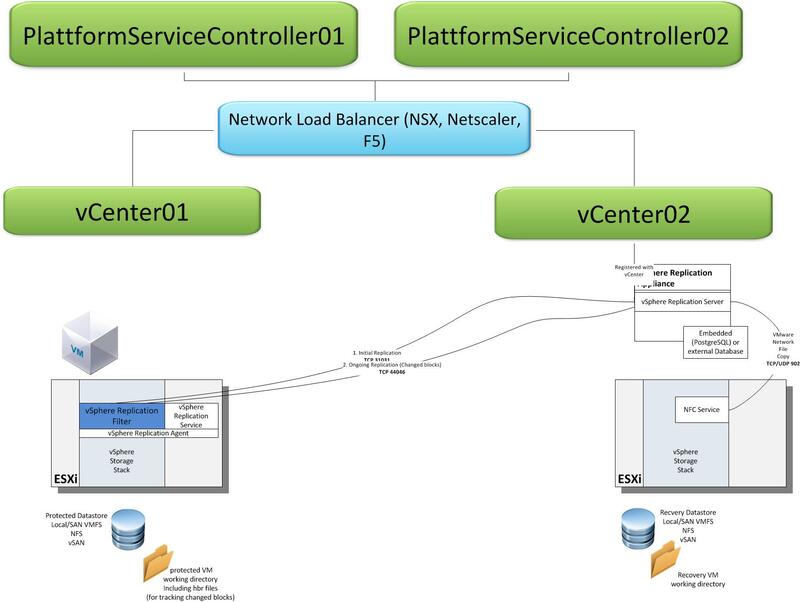 Since I summarized the architecture and components in part 1 I am now going to analyze the effects on the performance based on the network design decisions. 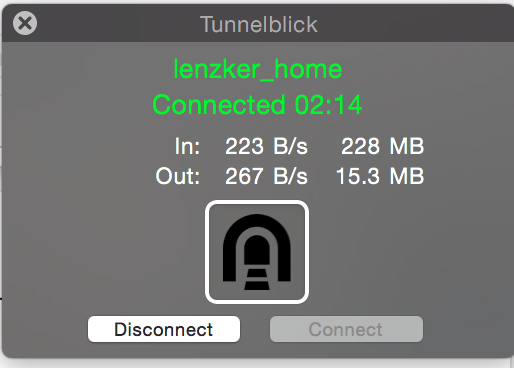 -> As expected the throughput dropped nearly by 50% to around 440 Mbit / s.
I know that those 2 results are depending on the specific characteristic of my homelab environment. The reason I have written that down was to create an awareness that the network decision has an impact on the replication performance and therefore maybe on the fact if you can meet an SLA or NOT. Let’s make a short calculation within a small scenario. To meet a SLA we are in most cases more interested about how long the ongoing replication will take place. So if you have an RPO defined with 15 minutes there is a risk not to meet the SLA within option 2.
number and size of your VMs. In production we don’t want to receive an RPO violation alarm (technically or by the service manager ;-). If you can’t meet the requirements in a theoretical calculation, you will not be able to meet them during daily operations. Which tool can we use to get the above metrics? Replication-throughput via ESXTOP (network-view: n), number and size of your VMs via PowerCLI (If haven’t done stuff with PowerCLI so far, this is a great starting task for it ;-). For gathering data about the data change-rate within a VM I refer to a PowerCLI script Scott Herold (his name was in the comments) has created a few years ago that used the change-block-tracking mechanism. I found the script via google and you can download it here (Download: CBT_Tracker – Howto). No need to say that you should understand it (and it’s influence on your system – it uses CBT and snapshots – see the comments within the script) and test the script first before you use it for your analysis. 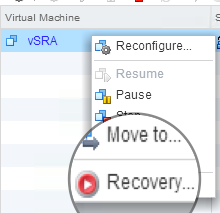 As I have already said VMware has included a new compression mechanism in 6.0 to speed up the initial copy job. During my first tests (Setup 1 with compression enabled) I had a higher CPU utilization (that’s expected on my vSphere Replication Appliance), but also a lower Throughput of the replication data. I am totally unaware what went wrong here. I will try to figure out more about this effect and keep you informed ;-). If you have any ideas/hints what went wrong in my setup. Please comment or contact via Twitter (@lenzker). I decided to quickly write down a few last words about a widely discussed topic before my 4 week journey to Brazil begins. The concept of transparent page sharing has been widely explained and the impact discussed in all of the years (whitepaper). 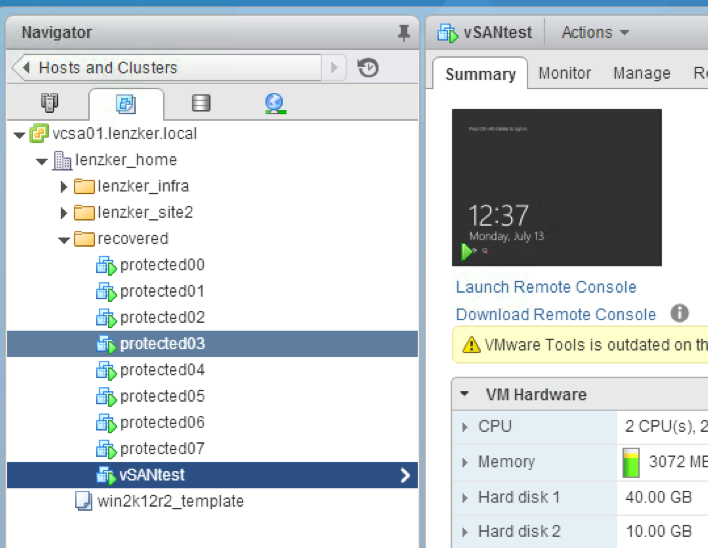 Short version: Multiple identical virtual memory pages are pointing to the same one page within the host memory. The general behaviour has changed multiple times with enhancements within AMD’s & Intel’ newer CPU generations where large pages were intensively used (2MB instead of 4KB areas –> Increasing the chance of a TLB-Hit) and the benefits of TPS couldn’t be used until the ESXi host gets under memory pressure and changes it’s memory state to break up with his girlfri….I mean the large pages into small ones. Last year some security concerns came up with this feature and VMware pro-actively deactivated the TPS feature with all newer ESXi versions and updates (KB). I don’t want to talk about the impacts and design decisions on productive systems, but on homelab environments instead. It is nearly a physical constant that a homelab always lacks of memory. By deactivating large pages & the new security mechanisms you can save a nice and predictable amount of consumed/host-backed memory. And especially in homelab environments the risk of a lower performance (caused by the higher memory access time through the higher probability of TLB-misses) and of security concerns might be mitigated. and wait a couple of minutes until TSP kicks in. So if you need a very quick approach to workaround the memory pressure in your homelab and you can live the potential performance loss –> re-activate Transparent page sharing as a first step to optimize your environment. Sure you can also skip the deactivation of large pages and hope that during a change in the memory state the large page breakup process is quick enough and therefore TPS works again. But I preferred a permanent and audit-able approach of monitoring the amount of shared memory in my lab. A few months ago a simple thought came into my mind and it didn’t left for several months. Yeah… I somehow felt inception-ized ;-). 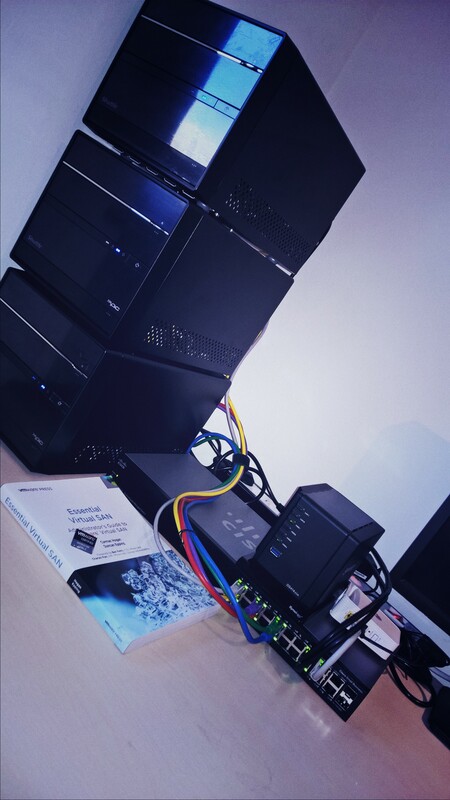 In the end of last year I had a phone-call with Manfred Hofer form vbrain.info about his great #homelab posts and design-decisions on his blog. Even though I did not chose one of his proposed designs I really like to thank you Fred for your efforts and great sum up. In the end I decided to go for the following solutions. 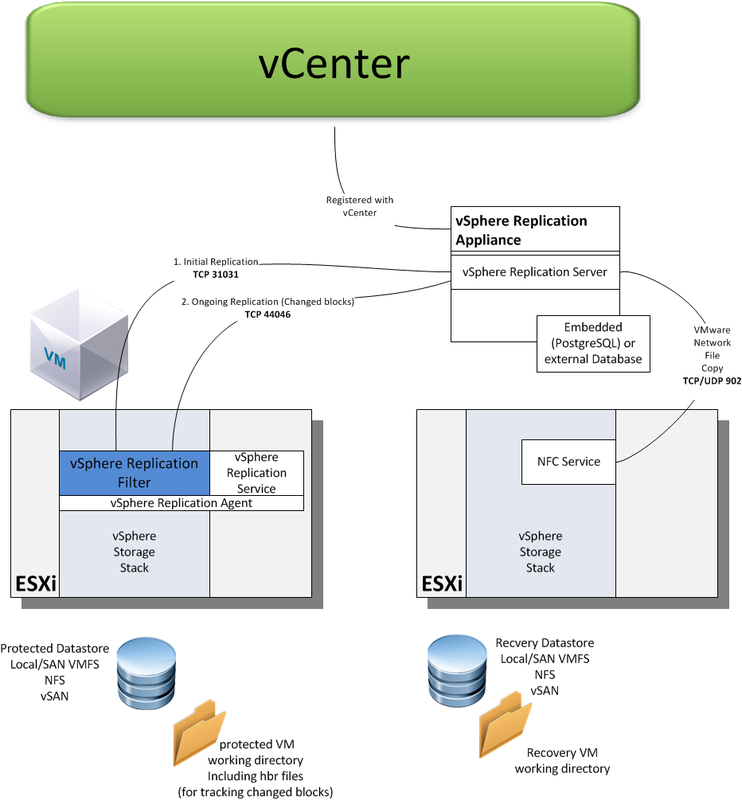 Currently I have vSphere 6.0 running with a vSAN 6.0 datastore. 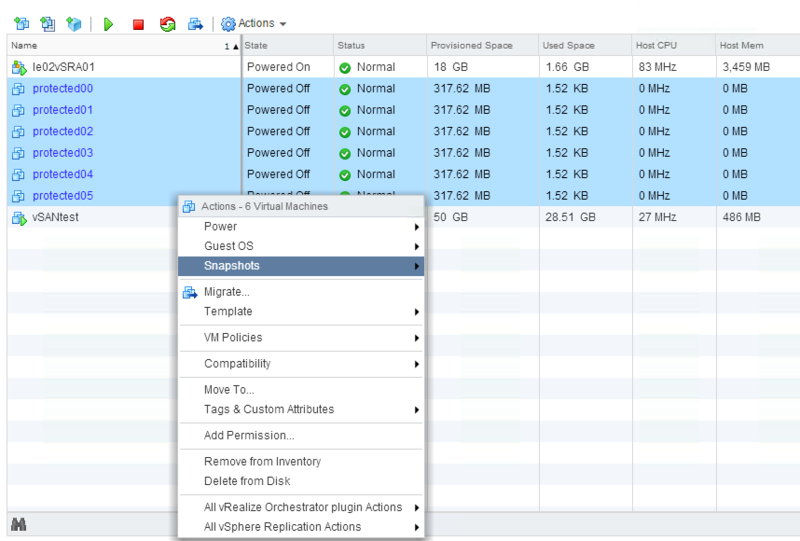 I have also decided to get a dedicated NFS share on the Synology for maintenance/testing reasons so I can easily demote/recreate the vSAN datastore. Having nearly everything on SSD gives me a performance that is suitable for me and gives me a chance to work efficient with new products (even if the local S-ATA controller are limited in their capabilities, but hey… it’s non-productive ;-). After optimizing some of my cabling and replacing the fan of the Shuttle Barebone I really like the solution on my desk. It’s powerful, small, scaleable enough for the next things I am planning to do. 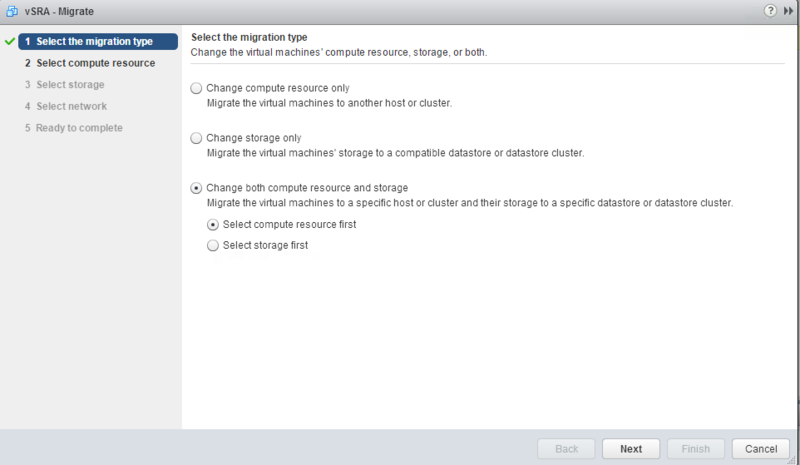 Even if my requirement for hardware is increasing I can scale-up the solution pretty quickly and easy. So far I was not able to get the embedded Realtek up and running with vSphere 6.0. But to be honest, I haven’t spent much time with it ;-). Once I have an update here, I will let you know. 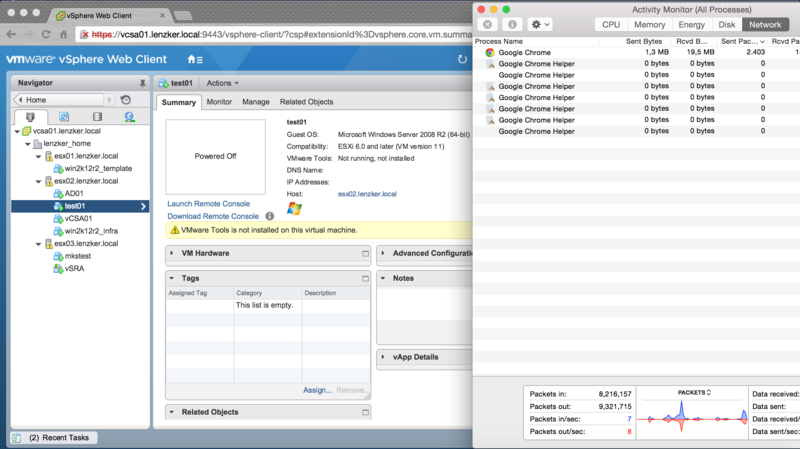 When I first installed vSphere 6.0 I was pretty impressed about the performance gain of the vSphere Web Client. Finally the Web Client is a tool I can work productive with and mustn’t be afraid to be marked as unproductive from my customers (it’s tough to argument a higher hour-rate if I wait 20% of my time for the UI 😉 ). So my homelab was installed with vSphere 6.0 and I tried to connect to it via VPN from my hotel wifi. Since the wifi was blocking my VPN attempts I was forced to tether/share the internet via my smartphone. Sharing internet on… starting OpenVPN against my homelab… opened Chrome to use the Web Client and.… the useability with the Web Client 6.0 was really really good. After a few minutes I received a warning by my provider T-mobile that my data plan has reached the 80% thresholds. I know 500MB included in my data plan is not that much, but still I was really suprised seeing this OpenVPN statistics after a few minutes. Since I haven’t used any other services than the vSphere Web Client I wanted to know how much bandwidth working in a local Browser via the Web Client really needs. I did this test with 2 Browsers Chrome and Firefox (to make sure the results are nearly identical) and observed the results via the activity monitor of MacOS. As a 3rd alternative I have chosen to use a remote connection via Microsoft Remote Desktop (native resolution, 16 Bit color) and did the same test-case steps mentioned above. Of course there are a lot of factors not considered (high activity on the vCenter that might increase the data most certainly), but the numbers should give you a feeling that the better performance of the Web Client seems to come side by side with a pretty bandwidth sensitive caching on the client side. 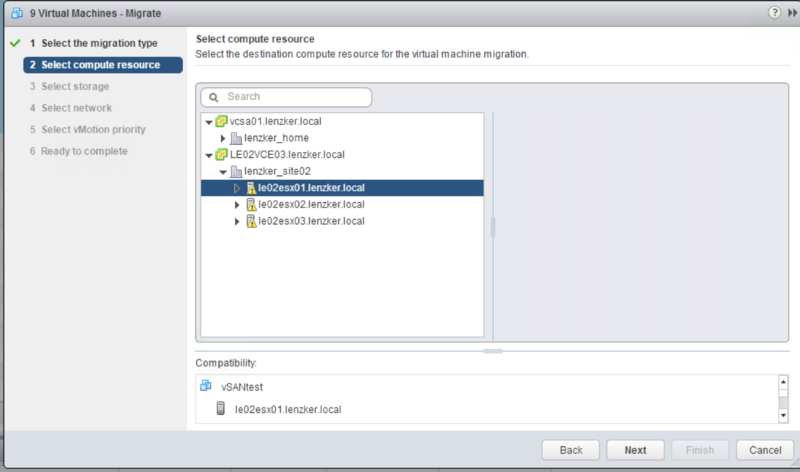 So if you work with limited bandwidth or any kind of throughput limitation use an RDP connection to a Control-Center VM within your environment that is able to use the Web Client for your daily vSphere operations.